In the first half of 2018, nearly two out of five Indian companies that made their initial public offering delivered positive returns. This came with a 27% leap in the number of deals when compared to the same period in 2017. And, in the first six months of 2018, IPO deals raised a record $3.9 billion. An Initial Public Offering (IPO) represents the sale of shares by a company to the public for the first time, i.e., an unlisted company selling a portion of its shares to the public for raising funds (referred to as a ‘public issue’) and thereby becoming a company that is listed and tradable on the stock exchanges. When the company needs more funds or additional capital, it can raise the same through debt or equity. In the case of IPO, the firm raises money as equity and thereby a portion of the ownership is now transferred to the public. India has seen a fair amount of IPO activity this year.But the real questions are – which IPOs are really worth investing in, and what factors should you keep in mind before investing in an IPO? Take a good look at the company, the nature of the business, its track record, the management, the competition, and its business outlook. A company in the growth stage may offer more potential for long-term capital appreciation. This information is usually available in the company’s ‘red herring prospectus’ which is a document that contains information about the issuer (the company offering shares for public subscription). The valuation of the company and the attractiveness of the IPO price band can be analyzed by reviewing the financials of the company, referring research reports, or by comparing with the valuation ratios of similar companies in the market. This will help in understanding if the IPO is over-priced, under-priced, or fairly-priced, and give you a holistic view of the company’s prospects. Firms may raise capital for several purposes, such as expanding to new markets, research, and development, for paying off debt, and many others. Usually, those that are pursuing growth strategies offer a better bet for gains from an IPO perspective. Valuing the company, even by comparing ratios with those of peers, is easier said than done. IPO subscription is a factor of demand and supply as well. Over and above the general market buzz or news, a more reliable way to try and understand the demand for the IPO is to look at the over/under-subscription in the other non-retail segments, i.e., in the Qualified Institutional Buyer (QIB) category and the Non-Institutional Investors (NII) segment. If there is over-subscription in these segments, it means the demand for the IPO is high. In addition to referring to the prospectus, demand, and other aspects, it would be prudent to study the grading for IPOs that credit rating agencies have to offer. An IPO grading of ‘4’ and above may possibly be a better choice. The IPO book building process is usually run by investment banks who serve as underwriters for the issue. IPOs can be subscribed only in lots (multiple of shares). For instance,one lot of 40 shares, or one lot of 13 shares, and so on, at a particular price band, say Rs. 150 to Rs. 165, or Rs. 1,200 to Rs. 1,298, and so on (these are just representative examples and can vary widely from issue to issue). The rules of allotment for each category are different. For RII (retail industrial investors), if there is an under-subscription in the retail segment, the investor is offered the number of lots he has subscribed. If there is an over-subscription, then the maximum allotment can be only one lot, arrived at by a draw of lots (out of the total unique retail investor accounts) that have subscribed to the issue at or above the final price that has been arrived at by a book building process. If you think there is potential for over-subscription, the best way to increase chances of allotment is to subscribe at the upper end of the price band, or preferably at the cut-off price, and also apply from multiple legitimate demat accounts that you may hold with family members or others. A simple tip is to invest at the cut-off price, which indicates your consent to pay whatever is the final price arrived at within the price band. The process varies for NIIs and QIBs, where the allotment is based on the proportion of shares applied for in the case of over-subscription. Some firms also offer to fund for subscribing to IPOs, also referred to as IPO funding. 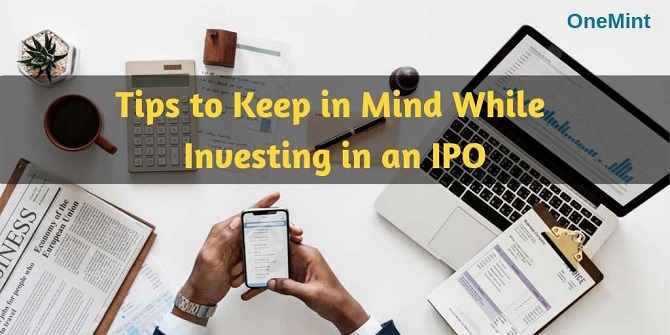 You should be clear of your intent behind investing in IPOs – is it for quick gains on account of potential initial upside, i.e., listing premiums, or is it for the long-term? This will determine whether you sell on listing or you hold for the long-term. Another option is to hold and watch what company insiders do after the lock-in period of an IPO and plan accordingly. It is essential to read and fill IPO forms in detail and correctly. That will ensure your forms do not get rejected, and that you are issued the right refunds and so on. It is also advisable that you go with a reliable broker. We have discussed at length the key factors to keep in mind while subscribing to an IPO. That said, be aware of the key risks in this process. You are ultimately investing in a company and all associated market risks apply. Further, there are risks where the IPO may not be fully subscribed which may entail a dip in the share price as compared to the price band. There is also the risk that the IPO maybe over-subscribed and you may not be allotted shares. There could always be other investment avenues than IPOs which may offer higher returns. Also note that these shares will always be available in the secondary market, so there may also be no need to rush to subscribe. IPOs are yet another investment opportunity that let you participate in a company’s growth story, or help profit through capital gains in potential listing premiums. All of this comes with its own set of risks and influential factors. Happy investing! Author Bio: Niyati Jetly is business development manager and evangelist at CIEL – Centre for Investment Education and Learning. To get grounded in IPO funding and investing, you may consider enrolling in quick online courses developed by CIEL. Thanks for valuable tips ,keep on it .waiting for next updates about IPO. Try to select a company that has a strong underwriter. We’re not saying that the big investment banks never bring duds public, but in general, quality brokerages bring quality companies public. Thanks for sharing a great blog with lots of useful info. I agree Niyati, IPO subscription provides investors with a great way to diversify their portfolio. Thank you for sharing with us your example on the allotment process and keep writing such informative blogs. Thanks for useful and informative article.